Drone/noise overlord Kevin Drumm has been on a serious tear as of late, self-releasing oodles of new material in small handcrafted editions that highlight his frigid, destructive and intensely minimalist approach to sonic architecture. Three of Drumm's most recent works comprise a loose trilogy of sorts, in that they were all recorded (ostensibly) in different rooms of his house; the result is an expansive and challenging series of recordings illustrating Drumm's various approaches to immersion, texture, and all-out noise assault. 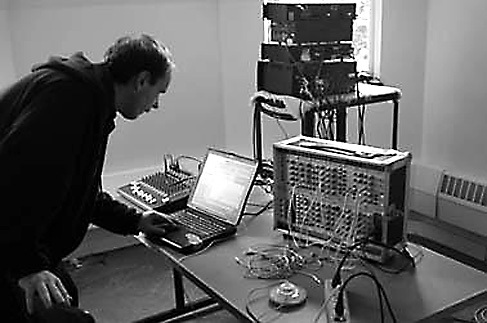 Few artists working with electronics and tone have such a singular vision: Drumm's work easily echoes old masters like Merzbow and Masonna but maintains something uniquely individual within its incendiary eruption, a wisp of black metal ferocity that betrays its creator's deep interest in northern extremity. Drumm's noise-sculpting is rooted in organic performance regardless of its instrumental inception, and these three albums all go beyond the simple processes of computer-generated tone abuse and manipulation. The resultant trilogy is a portrait of one of modern drone's masters at his most restless and agitated, a tour through the hellish anxieties of isolationism and defeat. The trilogy opens with this violent exploration of analogue terror and synthesizer holocausting, five tracks of shriek and static crafted into crushing waves of disorienting, severely uncomfortable sine wave abuse. Recalling and eclipsing the good majority of modern HNW recordings, "The Back Room" sees Drumm working off his own templates to erect a crumbling wall of diseased electronic detritus. The harshness and unapproachability that defined classic Drumm albums like "Sheer Hellish Miasma" and "Impish Tyrant" returns here in a flurry of knob-twiddling and chaotic cord-patching, all fed through a wealth of delays and quick edits to create something sounding like an electrical storm in Tartarus. Drumm also throws in some of the frequency difficulties he's been harnessing since his debut album, making "The Back Room" not only harsh in its sound but truly harsh to listen to. Through a pair of headphones the music becomes intensely oppressive, like a cloudy vice wrapping itself around the outer cartography of your brain and injecting quick shots of hallucinatory venom into its surface. This is a Drumm record free of any semblance of respite; gone are the lovely and saturated Radigue-like drones of "Imperial Distortion" and "Imperial Horizon," here replaced by a caustic and virtiolic desire to explore the outer regions of free-flowing electricity. The ghost of Aburptum hangs heavy over "The Back Room," with its listless shifts and seemingly random sojourns into spasms of blackened reverbation and white noise vagrancy, but never once do you fail to hear the actual human hand organizing and building the audio. 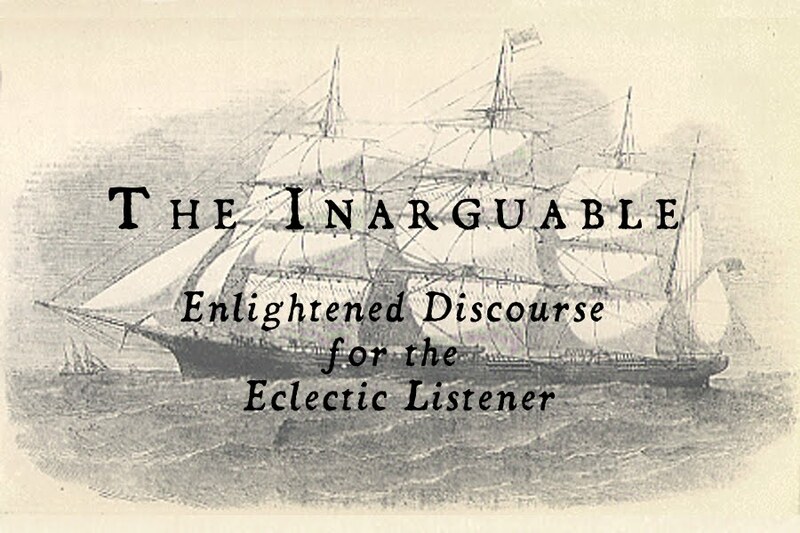 Best to simply let the distortion wash over you and eviscerate as it will; these sounds flay the flesh and gouge the frontal lobe in a dizzying manner that leaves little beyond breathless awe in its wake. This is Drumm in his most purely aggressive mode without the bombastic overloading of "SHM"; the intensity then becomes psychedelic rather than obliterating. 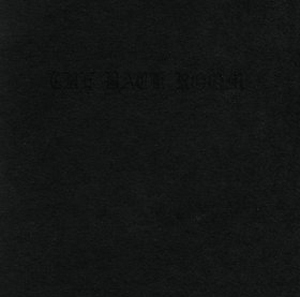 Transformative and evocative, rich in depth and texture, "The Back Room" is the necessary violent opening of the proverbial third eye. "The Kitchen" eschews all the hyperviolent absurdity of "The Back Room" and goes in a completely different direction. Here Drumm employs an accordion run through a Big Muff and processes some of the results, emerging with a gorgeous metallized drone that recalls both the hypnogogic psychedelia of Birchville Cat Motel and Drumm's own 2000 recording "Comedy," a vicious slab of oozing accordion vomit that totally rattles speakers and minds. 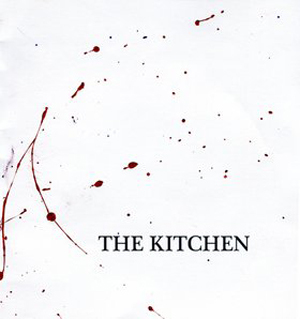 "The Kitchen" is appropriately dreamy, drifty, and primal in its minimalism, scarring across the mythic nowhere at its own glacial pace. Opening on a rush of lulling haze, Drumm bleeds the accordion into total saturation mode, pushing it to its sonic limits. The instrument rapidly approaches its meltdown point, fed through an assortment of delays and echoes until it becomes an endlessly recycled loop of melody, each note receding into the next. The piece becomes magnificent in its elegiac grandeur, sorrow sloughing off its body like so many wasted tears. Melancholia gives way to triumph which in turn becomes nostalghia, the stain of memory inflicted on patterns of distance and saturation. Drumm's accordion becomes a vessel of feeling, slowly rolling across mounds of human experience and approximation. Here the "heaviness" of some of Drumm's other recordings is referenced and his skill as a sculptor of tone becomes apparent: droning note fallout is shaped into massive swooning chords and the bitter sounds of regret, a severe and exhausting tour through the more depressive side of existentialism. "The Kitchen" gets close to a vintage Mogwai-like aura of defeatism, each bloated note serving to advance a narrow ideology of confusion, dismay, and sadness. The raw power of Drumm's approach on this album is truly something visionary, as he taps into the wealth of emotion and mood hinted at on "Imperial Distortion" but ultimately hidden by that piece's inherent reluctance; on "The Kitchen" that emotion pours forth like lava down a mountainside, threatening everything in its path with immolation. There is truly no escape. This is one of the definitive Kevin Drumm recordings, fusing the grace of his current drone works to the sheer and towering destructive power of his most abrasive noise assaults. The use of the accordion is an interesting self-reference, but the ultimate power of the piece as a whole isn't diminished by any suggestion of ideas already explored; instead Drumm shapes the accordion's sounds into something beyond mere drone, a mesmerizing envelope of suffocating, claustrophobic sorrow closer in spirit to the gauzy washouts of Tim Hecker than the hypnotizing austerity of Pauline Oliveros. Drumm has reached a high point with this album, a convergence of all of his ideas and influences into a flattening bed of intensity. "The Kitchen" is a portrait of isolationism at its most yearning. "The Whole House" closes out the trilogy in bizarre form, being both the most processed piece and the most distanced. 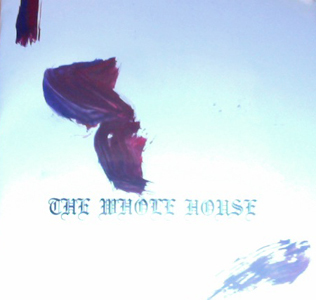 Comprised of two tracks, "The Whole House" finds Drumm working in both drone and cut-up/noise terrorist method to markedly polarizing results. The initial track is the more droning of the pair and ultimately the more successful; here Drumm relies on virtually no editing and instead presents a bizarre batch of recordings that sound like they're coming from a significant distance, which they more than likely are. The tones have a watery quality to them that makes me wonder if they weren't sourced from a washing machine, with a relentless churning and tumbling that becomes almost percussive in its squall. As the piece progresses the churning becomes more hypnotic and mesmerizing, gradually approaching a level of saturation and depth akin to early Sunn 0))) recordings before it spasms out into a torrent of noise and jolting free electricity. The second track jumps on that spasming and rides it into oblivion, showcasing Drumm's penchant for disarming, cacophonous edits and moments of alarming staccato silence. This is pure noise eruption arranged for maximum disconcertedness, an assumed sputtering out of ideas that manifests itself as mere flirtations with static deviance and tonal impatience. This section of "The Whole House" caters to earlier manifestations of Drumm's prepared guitar aestheticism despite little to no guitar as source; the jumpy nature of the piece erodes the free-flowing nature of the first section of the composition and gives way to a jittery bit of tension-generating electronics that aren't noise so much as they are itchy grievances. Drumm is in control throughout, generating a wealth of audio that seeks to alienate and discomfort the listener as much as it can. The palpable sense of distance realized in the first section comes to fruition here, recalling both the assaulting extremity of "The Back Room" as well as the immersive gravitational texture of "The Kitchen," arriving at a median that combines the two in way not wholly satisfying but notably intellectual. "The Whole House" isn't an experience so much as it is an exercise in which Drumm makes the listener work for meaning; experimentation in the truest sense, freedom as expulsion and composition as spontaneous evolution. Read separately, these three pieces represent a myriad approach to "computerized" music that ignores the rather stoic modality of standard ambiance in favor of an approach more brutally hands-on and wicked. As a triptych they become fairly overwhelming, a testament to Kevin Drumm's inexhaustible skills as a composer and arranger as well as his penchant for audience antagonism. Drumm is clearly comfortable with the uncomfortable, willing to go further into the unexplored than any of his contemporaries (and really, at this point, who the hell are they?). The great emptiness becomes audible in his hands, and the sounds existing in the universe's bleak outer vestiges find an outlet in his laptop. Despite any sort of label support, Kevin Drumm is releasing some of the most interesting and thought-provoking, as well as the loudest and most visceral, "electronic" music currently available. All of his recordings stand as evidence of a metal ideology infiltrating the more refined methods of structure, and all of his albums reference a distinctly metallized view of the current musical microcosm. Their considerable depth and weight more than marks them as worthy of exploration, but their irreverent approach to musicality marks them as masterpieces.